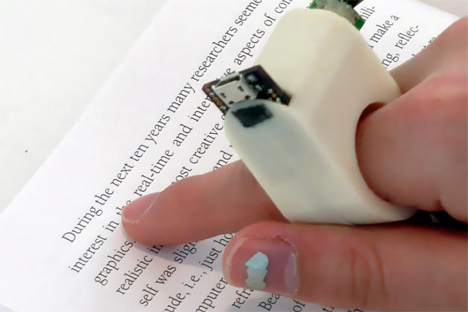 Researchers at the MIT Media Lab have come up with a prototype device that will read lines of text as the user runs a finger over the page. The FingerReader is a small device that fits over the knuckle of the index finger. It contains a camera which “reads” the text on the page and then says it aloud for the reader. For vision-impaired readers, this device could be an amazing step forward in how they read. Books that aren’t available in audio format would suddenly become accessible. The FingerReader doesn’t just read the words on the page; it indicates (via haptic cues) when the user has reached the end of a line, then when they reach the beginning of the next line. The device also indicates when the reader’s finger is drifting from the line of text and provides cues to move the finger higher or lower on the page. It’s obvious from the video above that the device is, in fact, a “research prototype.” It doesn’t work perfectly, and the voice conversion can definitely use some work. But the concept is so great that it’s bound to undergo further development until the kinks are ironed out. See more in Cybernetics or under Technology. April, 2014.